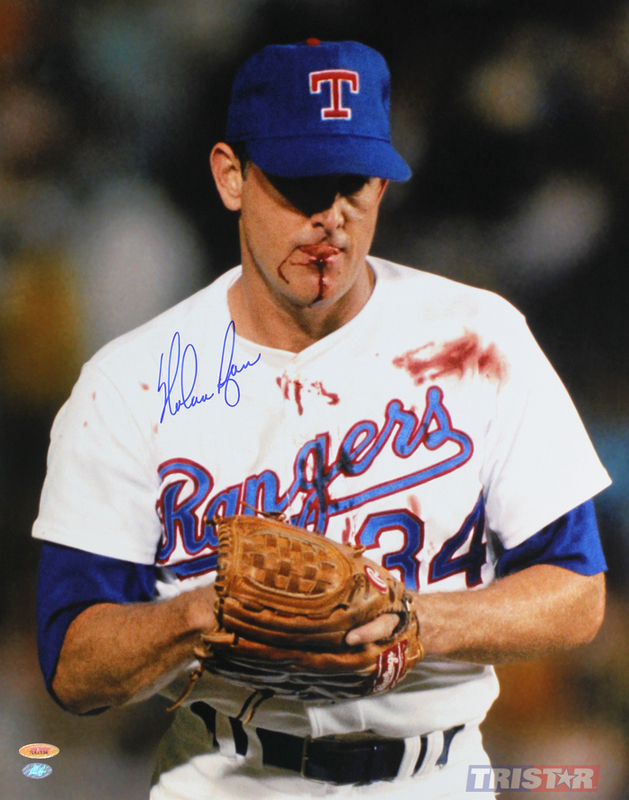 Nolan Ryan autographed, hand signed Texas Rangers Bloody Lip 16x20 photo. Nolan Ryan, The Ryan Express, blew through opposing hitters for 27 years, with 5,714 career strikeouts and 7 no-hitters, both MLB records. An intimidating force on the mound, Ryan was an 8-time All-Star, was named to the All-Century Team and was a first-ballot Hall of Fame inductee in 1999. For the Texas Rangers, Ryan twice led the AL in strikeouts and threw 2 no-hitters. This photo was taken on September 8, 1990, after Ryan was hit by a line drive by Bo Jackson. Ryan stayed in the game, pitching 7 innings as the Texas Rangers won 2-1. Each hand signed 16x20 photo includes an individually numbered, tamper-evident hologram from TRISTAR guaranteeing its authenticity, which can be verified at www.tristarauthentic.com.